Bikram Hot yoga is a series of 26 postures and 2 breathing exercises. Practiced in a heated room between 38 and 40 degrees Celsius and humidity of 40 to 60 percent. Classes are 90 min (for the original Bikram) and 70 min for an express class. The heat allows for deep and safe stretching and simultaneously detoxing and flushing all the toxins from the body, inside out bone to skin. Bikram Yoga aids in relieving stress and tension, strengthening and toning muscles, regulating body weight, increasing blood circulation, preventing chronic disease with the intention of restoring the body to its natural health. ​Classes are suitable for all levels of fitness and experience. The Standing Deep Breathing Pose is the first posture performed during any Bikram Yoga session, before the main 26 postures. This Half-Moon Pose is the first half of two postures performed as a single posture. This Hands-to-Feet Pose is the 2nd half of this single second posture in the Bikram Beginner series. Awkward Pose is a posture of three distinct parts. Standing Head to Knee Pose is simple to execute, yet it’s a posture that requires immense flexibility in the hamstring, hips, and upper back areas, but also great balance and stability. Standing Bow pose is a challenging standing balance. Balancing Stick Pose improves self-control, balance and the physical and mental condition. Triangle Pose, revitalises, strengthens and stretches the body and mind. Standing Separate Leg Head to Knee Pose in the Bikram Beginner Series. Tree Pose improves posture while strengthening the joints of the ankles, knees, and hips. Wind Removing Pose engages the core and increases hip flexibility. The Sit Up is great for centering your mind, energizing the body, and stretching your legs. Locust Pose engages the entire body and tones the buttocks, hips, and legs. Full Locust Pose works the mid-body. 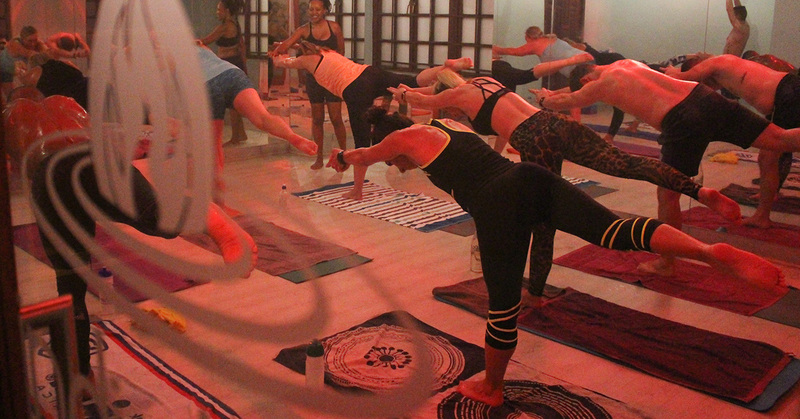 Bow Pose increases mobility of the spine. Blowing in Firm Pose increases circulation, removes exhalable toxins and metabolic waste products, and strengthens all abdominal muscles.